The “Your Layover Guide” series features airports and destinations around the world where you’re likely to be stuck between flights, offering tips on navigating and spending time in the airport, as well as suggesting things to do if you have time to explore the nearby city. TPG Contributor (and Miami native) Lane Nieset guides us through Miami International Airport (MIA). 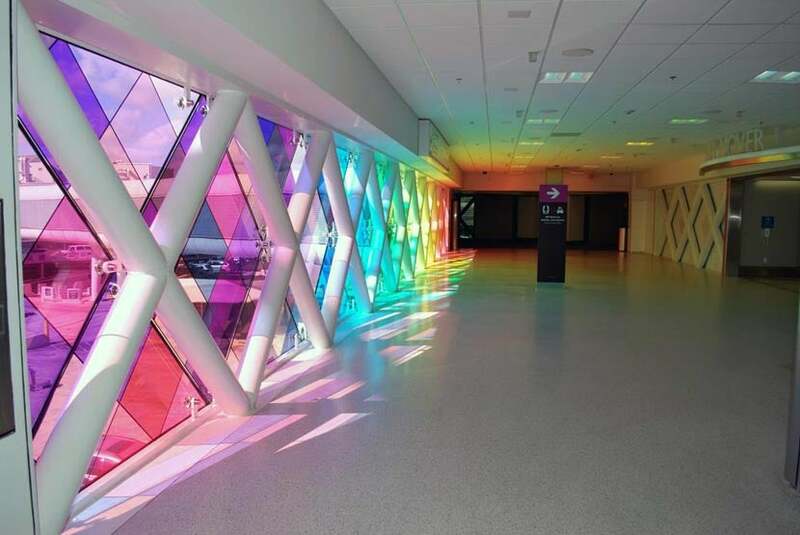 The art-filled Miami International Airport. Photo courtesy of Miami International Airport. North America’s second-busiest airport for international travel, Miami International Airport rightly earned its nickname as the “Gateway to Latin America and the Caribbean,” offering more flights to these destinations than any other airport in the US. With 99 carriers (including British Airways) flying nonstop to 150 destinations around the globe, this massive airport — which requires a Skytrain just to get through Terminal D — is easier to navigate that you might expect. There’s a reason we rated it one of the 7 Top Airports for Layovers in North America, after all. Here’s how to make your way through Miami’s airport, and what to keep an eye out for along the way. One of the many works of art at Miami airport. Photo courtesy of Galena Mosovich. 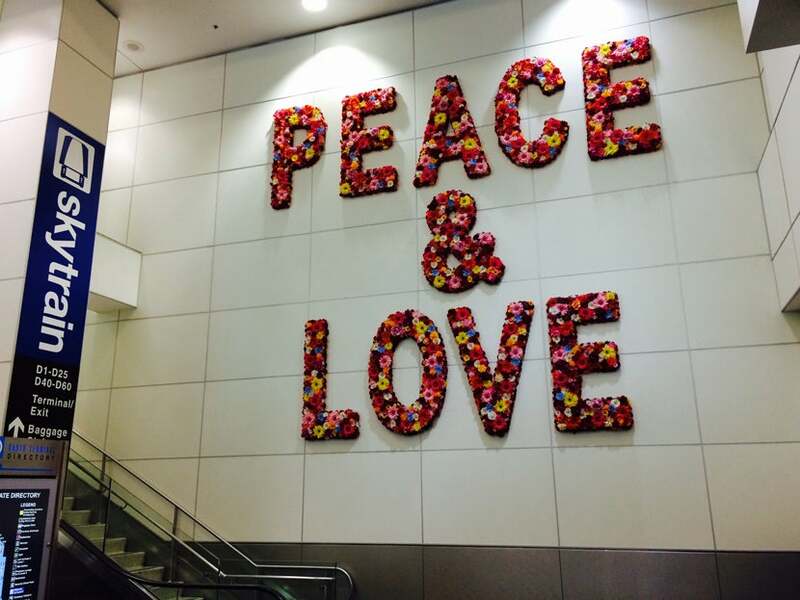 Miami International Airport is scattered with artwork all around, including Terminal D’s call for peace in the form of flowers spelling out “ALL WE NEED IS LOVE,” crafted by the Miami architect/artist team Rosario Marquardt and Roberto Behar. If you happen to be traveling through the South Terminal, you’ll be surrounded by Brazilian artist Carybé’s murals lining the escalator walls. In South Terminal J, 10 Minute Manicure offers express manis and pedis, while South Terminal H’s Jetsetter Spa offers treatments and spray tanning (if you want to fake a South Beach tan for your trip home). Boingo is behind the WiFi at the airport, so those with a subscription can access the Internet. Everyone else can purchase an hourly plan for $4.95 per hour, or $7.95 for 24 hours. The first 30 minutes, however, are free. The Amex Centurion Lounge is scheduled to open this summer. Photo courtesy of Miami International Airport. 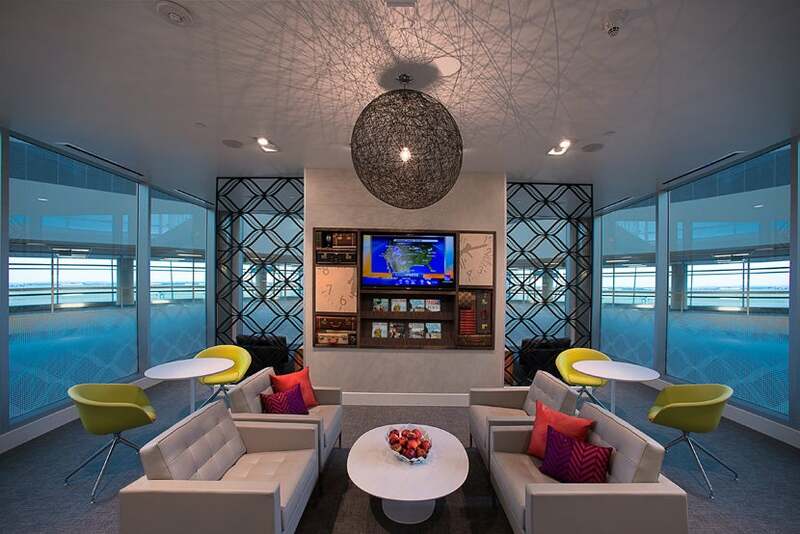 In the Delta Sky Club located in South Terminal H, members have access to complimentary WiFi, a full bar and showers. American Airlines passengers can access the Admirals Club by Gate D-30 and D-16 in North Terminal D, which features complimentary soft drinks, snacks, a quiet room, kids club, shower facilities and a music lounge with Bose headsets. Members invited to the VIP Lounge by LATAM lounge in South Terminal J can take advantage of a complimentary full bar, work stations, free WiFi, showers and snacks. An Amex Centurion Lounge is also slated to open this summer in the North Terminal and will feature cuisine by one of Miami’s top chefs, Michelle Bernstein. Store your bags in the baggage checkroom on the second level in Terminal E any time throughout the week between 5 am and 9 pm. Thomas Pink, one of the airport’s designer shops. Photo courtesy of Miami International Airport. Locally owned bookstore Books & Books has drawn a cult crowd in Miami thanks to its avant-garde selection of coffee table fodder and international magazines, and it has an airport outpost in Terminal D. If you forgot your bikini or need to pick up something for the beach, stop in Ron Jon Surf Shop in Terminal G on your way out past the checkpoint. The airport also has a selection of designer shops, such as Emporio Armani and Thomas Pink in Terminal D; Hugo Boss in Terminal J; and Michael Kors in Terminals D and H. One of our favorite picks for snagging both accessories and lavish seafood is Terminal D’s The Shoppes at Ocean Drive, with the Privé Gourmet Market located in the center. Some of the best spots in town have outposts at the airport, so even if you can’t make it into Miami, you can still get an authentic taste of the city. If you’re flying on American Airlines out of Terminal D, you’ll be near Icebox Cafe, known for fresh pastries and fabulous hot plates such as Adobo pulled pork and Black Angus meatloaf. La Carreta, which originally started in Miami’s Little Havana, is also in Terminal D, and offers both sit-down seating as well as a cafe counter if you want to take your Cuban coffee to go. Café Versailles is another Cuban hotspot in Miami that makes killer Cuban sandwiches, and the restaurant has a few locations spread throughout Terminals D, E and F. Of course, you’ll also find a great selection of chains like Au Bon Pain and Sushi Maki in Terminal D, as well as Starbucks and California Pizza Kitchen in Terminal E. For more ideas on where to eat during a layover, see our post The Ultimate Guide to the Best Airport Restaurants in the US. Miami’s Metrorail is one public transportation option throughout town. Photo courtesy of Miami International Airport. Despite being such a large city, Miami still has miles to go when it comes to public transport. 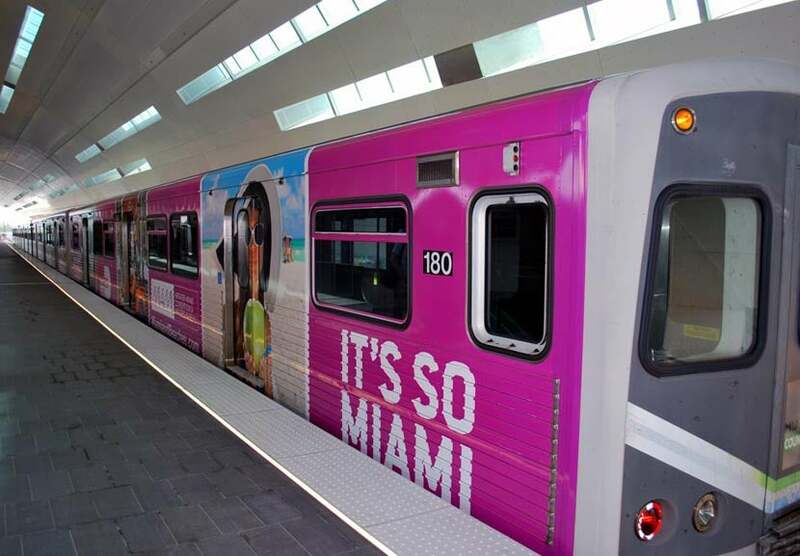 One option for travelers is the electric-powered MIA Mover train, which heads from the station on the third level between the Dolphin and Flamingo garages on a 1.25-mile ride to Miami Central Station, connecting with the Metrobus, Metrorail and rental car center. One easy way to get to the beach is on the Miami Beach Airport Flyer bus, which runs between the Metrorail station and Miami Beach (from 41st Street to South Point Drive) every 30 minutes from 6 am to 11:40 pm. It’s $2.65 each way, and travelers can purchase tickets from one of the EASY Card vending machines in the station. Hop on the orange Metrorail line if you’re heading to Dadeland, with stops in Brickell, Vizcaya, Coconut Grove and Dadeland Mall. Fares are $2.25 each way. The quickest way to get right where you want to go would be by taxi or Uber — though, as you’ll see in this post, both options have their drawbacks. Sample taxi rates are $32 to Lincoln Road on South Beach or around $21 to Downtown and the port, while an Uber to Lincoln Road starts at $19. 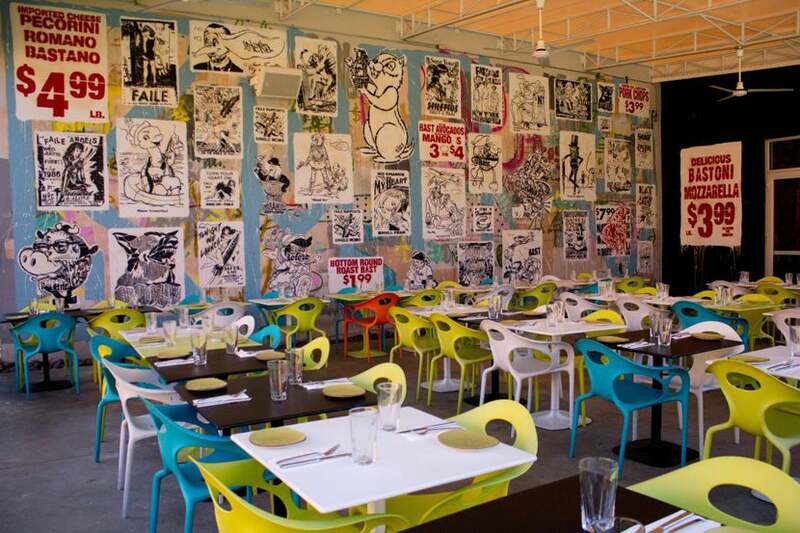 Dine al fresco amongst the street art at Wynwood Kitchen & Bar. Photo courtesy of Sara Boni for CME. If the weather is nice but you don’t have time for a beach day, stroll through the Wynwood Arts District and its street art-lined walls, which are slowly starting to rival Berlin and other cities. Take in the living murals from a seat perched on Wynwood Kitchen & Bar’s outside patio, set between the Wynwood Walls murals, and gear up for a Latin-inspired lunch of plates like ropa vieja empanadas and baby octopus skewers with lemon garlic mojo. Those looking to dig deeper into the art scene here can book a one-hour Wynwood Mural Tour and learn more about the artists behind the wall work. If you’re in need of a pre-flight caffeine boost before leaving the neighborhood, pop into Panther Coffee, a local roaster that brews one of the best cups of coffee in town. Travelers looking for a more traditional museum setting can stop by Downtown Miami’s new modern and contemporary art museum, Pérez Art Museum Miami, set right on Biscayne Bay. The museum’s international art artwork spans the 20th and 21st centuries, with past exhibitions by Ai Weiwei and Beatriz Milhazes. If you’ve worked up an appetite, Verde at the museum offers prime views of the water from its outdoor patio and serves up locally sourced cuisine with a Miami spin, such as wahoo ceviche and local snapper tiradito. Tip: It’s best to have at least a five-hour layover if you’re heading into town, given Miami’s terrible traffic and the airport’s notoriously long security lines. The art- and fashion-focused Design District. Photo by Lane Nieset. Miami is the kind of place you could spend a whole week in and never see the beach — although the sandy white shores are worth a visit. The cliché image of South Beach and its string of neon-lit bars and clubs is one way to see the city, but there are other parts worth exploring. 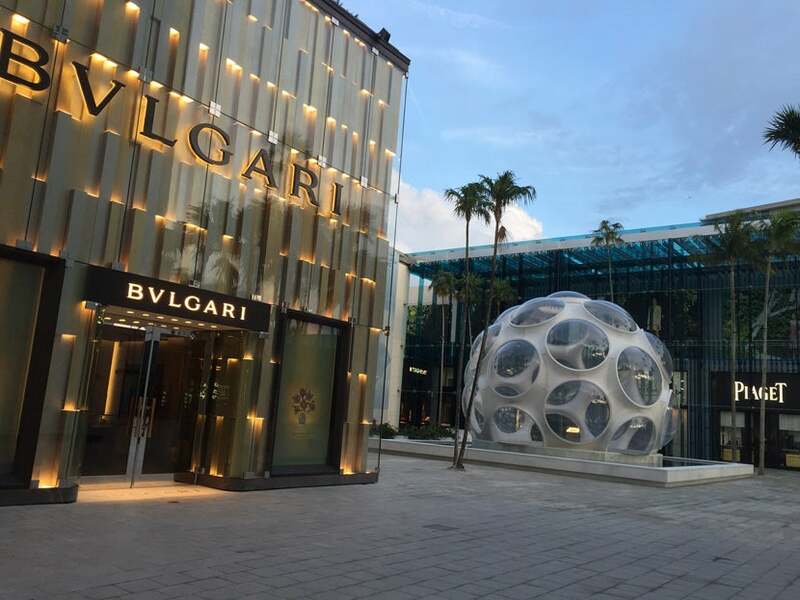 The Design District near Midtown is rapidly becoming a premier shopping and dining destination, with luxe new boutiques from Rolex to Harry Winston moving into the neighborhood. The area also boasts some of Miami’s top eateries, such as Michael’s Genuine Food & Drink and Mandolin Aegean Bistro. Of course Lincoln Road is still a classic for shopping along the pedestrian strip lined with both chains and local boutiques, such as Alchemist, a high-end shop set inside the 1111 Lincoln Road parking garage. Meanwhile, those interested in exploring Miami’s history can embark on a 90-minute Art Deco walking tour to learn more about these South Beach structures that embody the city today. 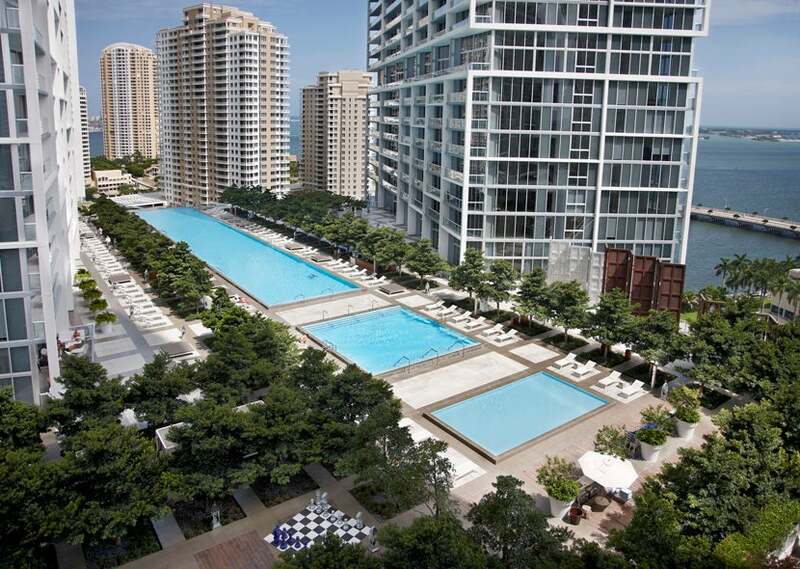 More interested in Miami’s millionaire lifestyle? Cruise by homes of the rich and famous on a 90-minute yacht cruise through “Millionaire’s Row” with picture-perfect views of the skyline in the background. For more ideas on ways to spend your day in Miami, see our post My Miami: Inside Tips on Where to Beach, Eat, Party & More. The Viceroy Miami’s 15th-floor rooftop infinity pool. Photo courtesy of Viceroy Miami. Don’t want to leave the airport or waiting on an early flight? The 259-room Miami International Airport Hotel is set in concourse E on the second floor with soundproof rooms and suites outfitted with a Sealy Posturepedic sleep system, flat-screen TVs, and concierge baggage service if you need it. Rates start at $139 per night. In downtown Miami, the luxurious 148-room Viceroy hotel is an urban oasis that includes views of Biscayne Bay from Florida’s longest rooftop infinity pool. The 15th-floor restaurant, 15th & Vine Kitchen & Bar, shows off panoramic views of the bay below and is a favorite for fresh cocktails. Rates start at $214 per night. For something more high-energy, head to Collins Avenue, a strip of South Beach known for fabulous hotel bars and clubs. 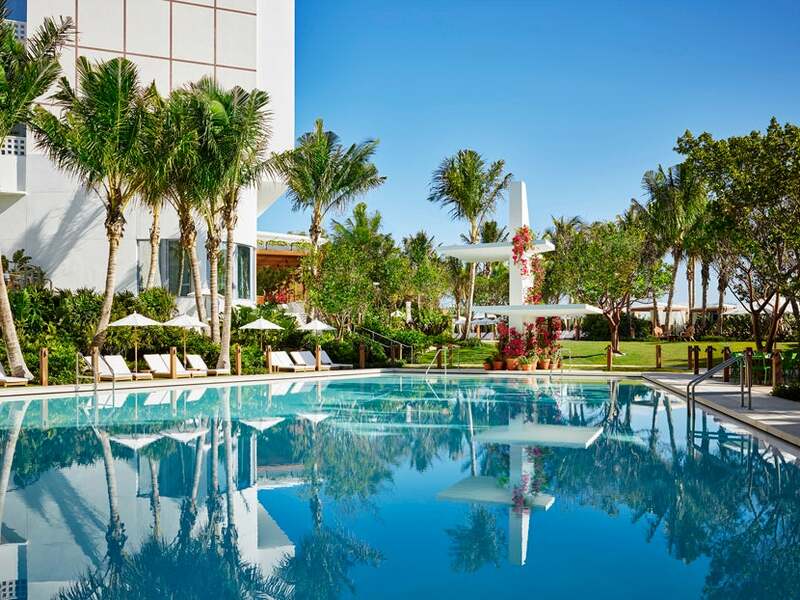 The SLS South Beach Miami, starting at about $400 a night, is famed for its quirky Philippe Starck design, its José Andrés menu and the party scene at the Hyde Beach pool. For a slightly quieter stay along Collins, look into the casual, laid-back Blue Moon Hotel, a Marriott Category 8 property from the Autograph Collection that has a smaller wading pool with no party scene, which starts at roughly $200 or 40,000 Marriott Rewards a night. One of the newest hotels in Miami that’s drawing quite a buzz is Ian Schrager’s The Miami Beach Edition. The 294-room hotel has everything to keep you entertained without ever having to leave the property, from the Jean-Georges Vongerichten restaurant Matador Room to the underground nightclub/bowling alley/ice skating rink Basement, a tribute to Studio 54. Rates start at $509 or 60,000 Ritz-Carlton Rewards Points per night. How do you pass the time during a layover at Miami International Airport?